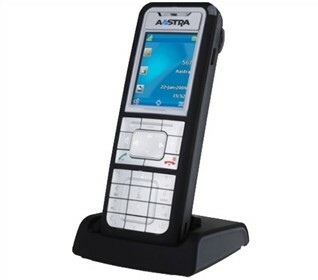 The Aastra 612d is the high-end DECT business telephone for the business sector. It includes several cool features such as caller id/call waiting this way one can see who is calling before picking up the phone. With the ambient noise filter the phone can automatically adjust the ring tone and talk volume to the background noise in any given situation and filters out any disturbing noise. It has a beautiful 2" color LCD display which guarantees an outstanding overview and simple operation of the clearly structured menus at all times. The product is equipped with a Bluetooth interface for a cordless headset as well as the ability to talk up to 12 hours at a time. Plus, the 3 colour multi-purpose LED can be set for visualisation of functions. The Aastra 612d has many exciting features for users of all types. You can extend the lifetime of your Aastra 612d with the purchase of a FactoryOutletStore Factory Protection Plan. See the Aastra 612d gallery images above for more product views. The Aastra 612d is sold as a Brand New Unopened Item.